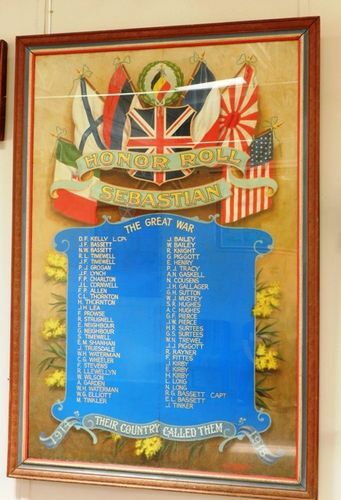 This honour roll and the World War Two honour roll were held initially at the Sebastian Hall in Main Street. They were then shifted to the Sebastian Hotel for 38 years after the hall was moved and placed over a fireplace that caused damage. Both were restored in late 2011 and rededicated on the 10th of November 2011. Over 200 people attended the dedication. The hotel closed in January 2012 and the rolls were moved yet again to the Sebastian Community Centre, at the site of the old school. This honour roll was restored by the Castlemaine Art Gallery. At the Sebastian Public Hall last evening, in the presence of an overflowing audience, the honor roll of soldiers from the district who had given their services to the Empire was unveiled by Cr. Daly. The hall was decorated with flags, bunting, and evergreen, and an entertaining programme of musical items by Eaglehawk artists was thoroughly enjoyed. The chairman (Mr. Frank Hannan), introduced Cr. Daly who, prior to unveiling the roll, paid a tribute to the brave lads from the district who had gone forth, to fight the Empire's battle for freedom and truth. Sebastian, by its contribution to the Australian forces, had upheld the best traditions of the Empire, and in time to come the part her boys had played in the war, would be surrounded in glory. The deeds of bravery of the Australians, in common with other units of the Empire, would never fade from the memory of Australians who were proud to be kith and kin of the Anzacs who had helped so much to make the nation's history. The unveiling was accompanied with loud applause and the singing of appropriate patriotic songs. The honor roll is beautifully executed, being the handiwork of Mr. Berne Marcollo. It measures 6 ft by 4ft, and the list of 58 names is surmounted with the grouped flags of the Allied nations, a large kangaroo forming the background. Bendigo Independent (Vic), 18 September 1917.